Pumpkin Spice Donut Muffins are my preferred method of getting my pumpkin spice latte fix! Easy pumpkin muffins are tossed in a cinnamon sugar coating! You will love the delicious fall flavors in this pumpkin recipe! Pumpkin Spice Donut Muffins are my absolute new favorite fall snack. They are the perfect mix of a dense, pumpkin muffin, with a light and airy donut! Better yet, this a yeast free donut recipe, so there’s really no baking skills required! I don’t know about you, but I tend to kill my yeast, so I am always looking for easy baking recipes that don’t require any rising! I wish I could say that these cooler temps have me feeling fall like, but guys, it is blazing. I live in Pennsylvania. It should not be so hot in September! I am going to start eating fall foods though and these Pumpkin Spice Donut Muffins were one of the first pumpkin recipes on the blog, and it is time that this post got a well needed make over! I always thought making homemade donuts would be hard so I never attempted them before, but I was wrong, they are so easy! These homemade Pumpkin Spice Donut Holes are a cross between a mini muffin and a donut. If you eat them the day they are made, they are more donut like, while if you eat them the next day, they are more of a dense muffin. Either way, you can’t go wrong, although I prefer them the same day they are made. What do you need to make homemade donuts? Since there is no yeast involved, anyone can make these donuts and in a short period of time! I whipped these out during nap time today and still had time to clean up! Better yet, these don’t require a donut pan or frying, they just bake up deliciously in a mini muffin pan ( I LOVE this silicone one, so easy to clean!!! I love when things don’t require fancy equipment that you can only use for one or two things! Try these for your next Saturday breakfast or if you want to take a special treat in for your co-workers…they surely won’t be disappointed! They would be a great after school surprise snack for your kiddos too! They are small, so they can just be popped into their little mouths! These are perfect for portion control…although I bet you can’t eat just one! If you love easy pumpkin recipes then you need to try my Easy Pumpkin Pie Crescent Roll Ups. Looking for more easy pumpkin recipes? Preheat oven to 350 degrees and then grease a mini muffin pan with cooking spray. Whisk together flour, baking powder, salt, cinnamon, and pumpkin pie spice. In a separate bowl, whisk together oil, brown sugar, egg, pumpkin, and milk until well combined. Mix wet ingredients into the dry ingredients until no lumps remain. Fill mini muffin cups to the top and then bake 10-12 minutes or until a toothpick comes out clean. You will have remaining batter for the next batch. While they cook, melt butter in a microwave safe bowl and then in a separate bowl, whisk together the sugar, cinnamon, and pumpkin spice. Remove donuts from oven and then remove from muffin tin. Let cool for a few minutes until they are warm, but not hot, to the touch and then roll the muffin in the butter. While holding the muffin over the cinnamon sugar bowl, spoon sugar mixture over the muffin until coated on all sides. Repeat with remaining muffins. These are so good you are going to want to eat them all straight from the oven, but if you are making them for a future date, I recommend waiting to cinnamon and sugar them until right before you serve them. The cinnamon and sugar ¨melts" over time into more of a glaze and the donuts lose their crispness. They still taste delicious, but the texture will be different. Thank you so much Ellen! I will be checking out your blog!! These look amazing. I am so hungry for some these right now. I know what I will be making this weekend. Thanks for the recipe. Um… yes please!!! These look absolutely incredible! I feel a sudden urge to host a brunch gathering now. Thanks for the awesome recipe! Marie…don’t even wait for brunch! Make them for yourself!! They are so good!! I could lick my screen! They look amazing, must try soon. Pinning! I am all for anything with the word “pumpkin” in it. Then this is also donuts, too much yummy goodness! I am not usually the most excited about the pumpkin spice season but I need these in my life, err, stomach now! lol Pinning to make soon. This look amazing!! I can’t wait to give them a try! Oh man! 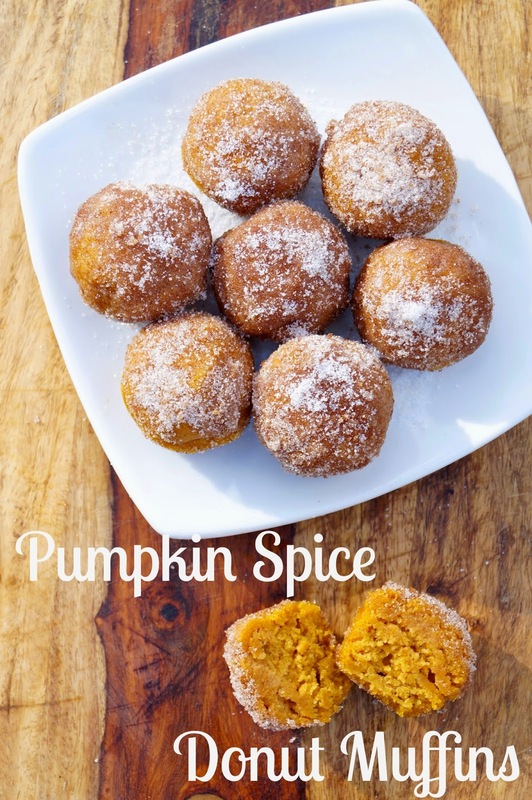 I need these right now and I happen to have some pumpkin puree in my fridge right now left over from another recipe. Yum! Pinned. Sounds like you should definitely make them!! These look so delicious and easy to make! Definitely saving this post. Thanks Anna! They are definitely easy! I made these today and they taste as good as they look in the pictures!! Easy to make and they are full of flavor and very moist! I’m so glad you liked them Betsy! Thank you so much for stopping by and letting me know!! Made these last night for this mornings mom group. They were a big hit!!! So good!! I am so glad you liked them!! I made these tonight for hubbys unit event tomorrow. Unfort, I misread to dip them in butter and then the sugar and spices. I made a glaze. I used a syringe to insert it into the muffin and then topped the top of it. The glaze was amazing, too. Hoping these are a hit! Thats a great idea to insert these with glaze!! I hope your husband’s friends love them! They did! Gave 3 people the recipe! YAY! I am so glad!!! Just finished making these and wow are they good!! I ended up using half all purpose flour and half cake flour. Pumpkin doughnuts fresh out of my oven… are you kidding me?! 🙂 YUM. I’m so glad you liked them Sara! They are seriously so good and there is nothing better than a fresh, warm donut!! What is the best way to store them so the sugar does not melt into it? I would try the fridge in an air tight container. I think you will still have some meltage though!